Faëlwyn and Theron are two minor characters in my novella who are already in an established relationship. 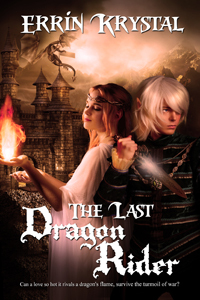 The novella focus’s on Faë’s twin brother, the elven prince, Flintathriël, during the events of The Dragon Wars. I grew to love Faëlwyn as much as her brother and wanted to explore more of her story through other means. I hope you enjoy Faë’s first meeting with Theron. I really enjoyed writing it for you. Faëlwyn lined up with the rest of the initiates in the training yard, reaching behind and securing her long hair in a bun at the base of her neck. She glanced down the line, recognising only one pair of silver-blue eyes that stared back in amusement. Her brother, Flintathriël, smirked at her and she could not resist poking her tongue out. Both of them had been accepted to try out for the ranks of the Nuvian, an ancient and elite warrior order. Faëlwyn snapped back in line, her back straight. Murmurs rose amongst the recruits as the Commander approached, stopping before her, dust swirling at his bare feet. “Silence!” He commanded, and the initiates dropped their gazes, an unnatural quiet settled over the grounds. His rich baritone sent a shiver of delight down her spine. She glanced up, her gaze boldly raking his form as it travelled the length of his toned and muscled body, to the broad expanse of his shoulders. He was taller than the other boys, and she had no doubt they were boys, Commander Theron was a man. Auburn hair fell to his shoulders, pulled back in a partial braid, the full length of his pointed ears exposed, and a light smattering of freckles adorned his sun-kissed face. Faëlwyn had a sudden urge to know if he had freckles elsewhere on that tight firm body. She raised her gaze fully to see a pair of sea-green eyes staring hard back at her and her stomach fluttered under his scrutiny, his lips pressed into a thin line. “Can I help you princess?” She heard a snicker down the line, unmistakably her brother. “Of course not, Commander,” She lowered her voice to a sultry whisper, a coy smile tugged at her mouth. The Commander bristled and cleared his throat before tearing his hardened gaze from hers and moving down the line, hands clasped behind his back. Faëlwyn watched him continue down the line, his back to her as he explained the training schedule and she had decided one thing.